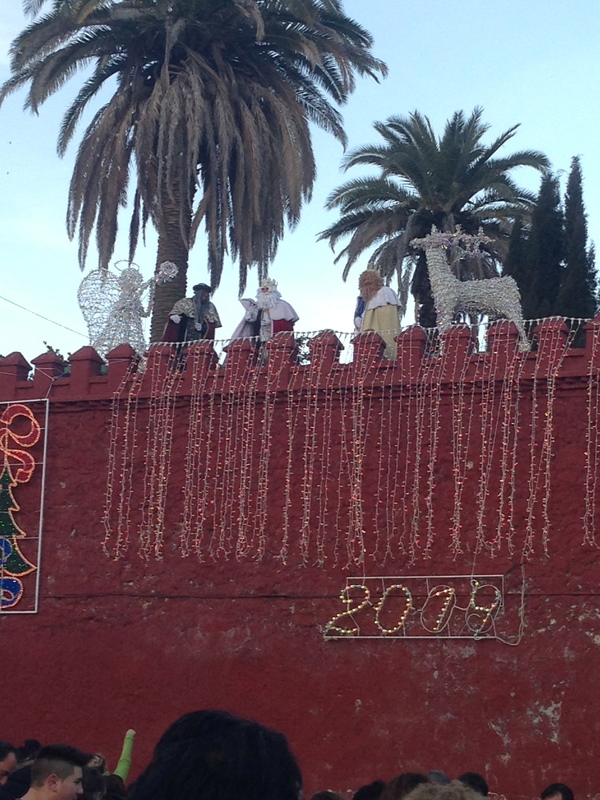 Christmas lights in Alhama. See the Christmas tree in the background? 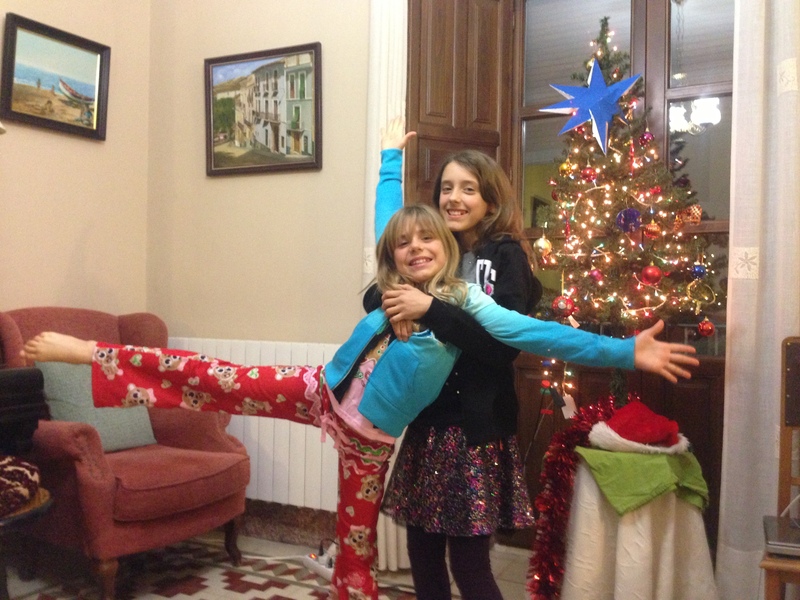 We returned from our holiday travels to Paris and London just in time to join in the Spanish Christmas fun. Lucky for us Christmas Eve and Christmas Day are celebrated with family and are special, but the difference in Spanish Christmas is that the bigger celebration occurs on El Día de Los Tres Reyes. 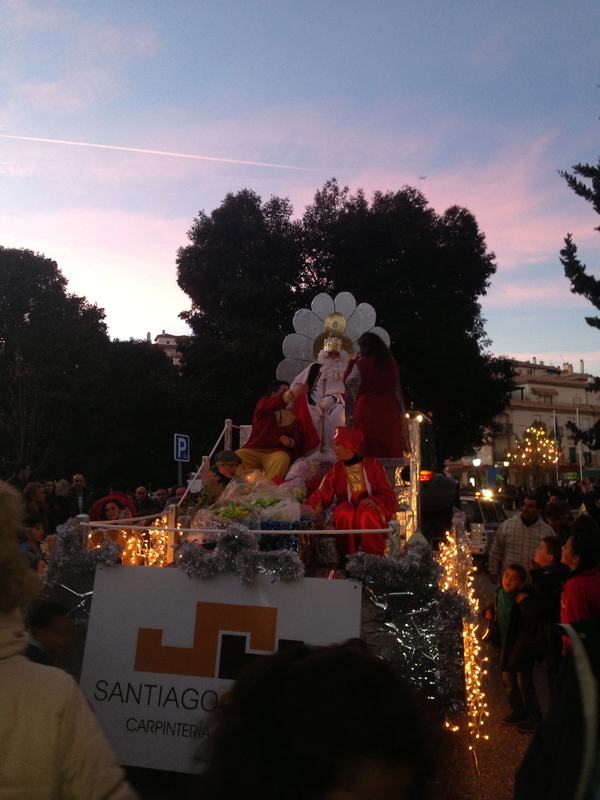 The festivities begin on the evening of January 5th with the Cabalgata de Reyes. The cabalgata in Alhama de Granada is a parade that consists of 3 floats, one for each rey (king). In Alhama the Jameños (slang for locals in Alhama) have the tradition that each year the Reyes are chosen from a specific profession. This year they were all local carpinteros (carpenters) while last year they were peluqueros (hair stylists). Getting ready to leave from city hall. Note the John Deere tractor pulling the float. The cabalgata begins in the Plaza de Cisne about a 1/2 block from our apartment. The entire town comes out for the festivities. We gathered with friends and neighbors to await the parade. 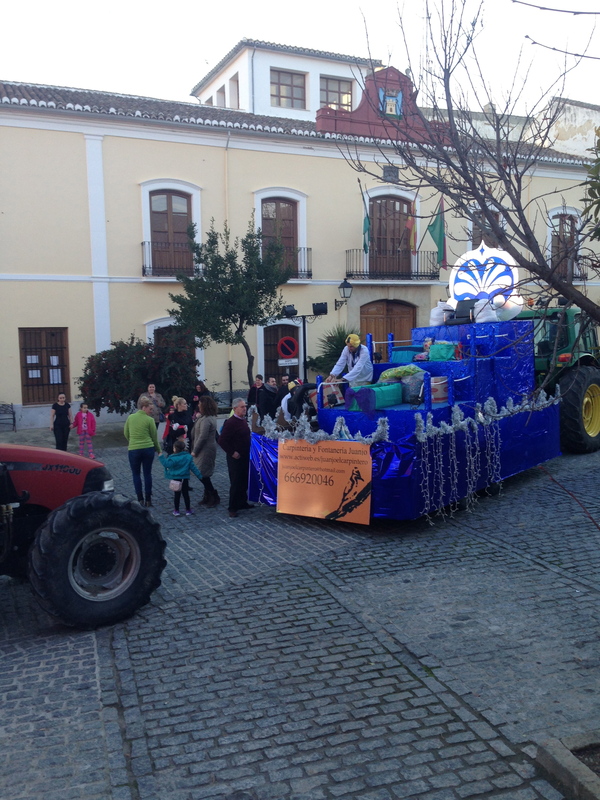 A large John Deere tractor pulled each of the gaudily decorated floats that were carrying Baltazar, Gaspar and Melchor. I have read that in other parts of Spain the parade might have 30 floats. In tiny Alhama 3 were enough. The Jameños follow the kings for the length of the parade route. The floats were well patrolled by locals in orange vests who were careful to keep stray children away from the giant tractor wheels. 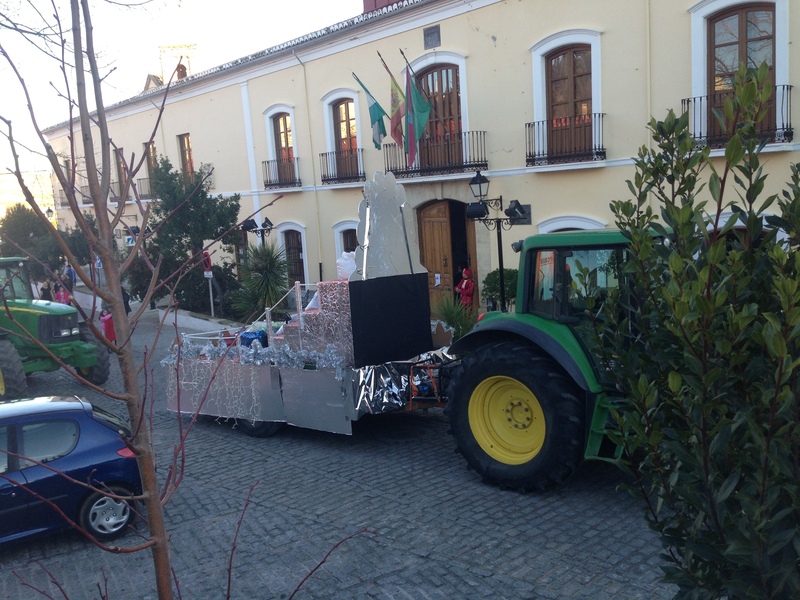 Tragically, last year, in the larger neighboring city of Malaga a child was killed by one of the tractors. With that memory fresh, everyone was very careful. 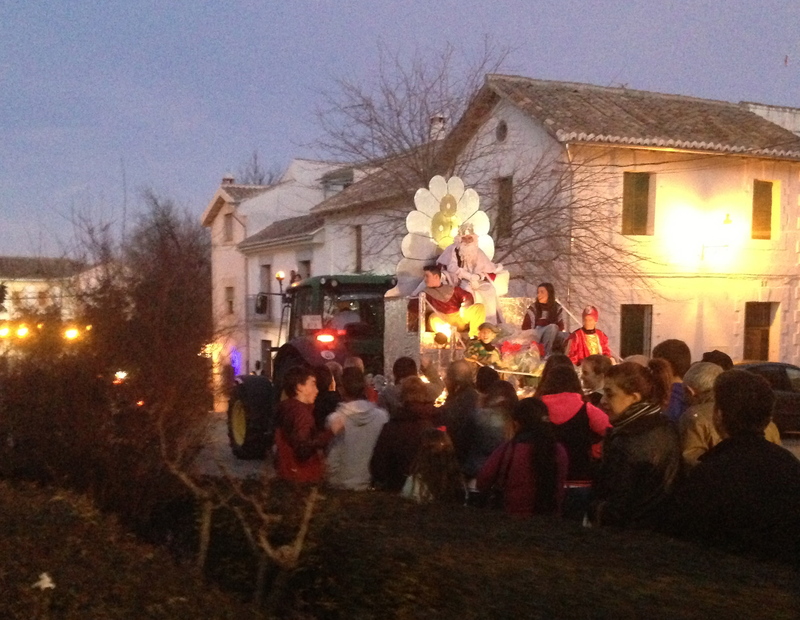 The floats stopped at designated parks and plazas throughout our village. The kings throw loads of candy at the crowds. One mother joked that she was going to carry an inverted umbrella. It would serve 2 purposes one to protect her from the barrage of candies and also to collect the candy. Their majesties and their many assistants on board their carriages had strong arms and we were pelted with sweets. Despite the bruises we enjoyed the candy! The parade symbolizes the coming of the 3 Wise Men to Bethlehem. 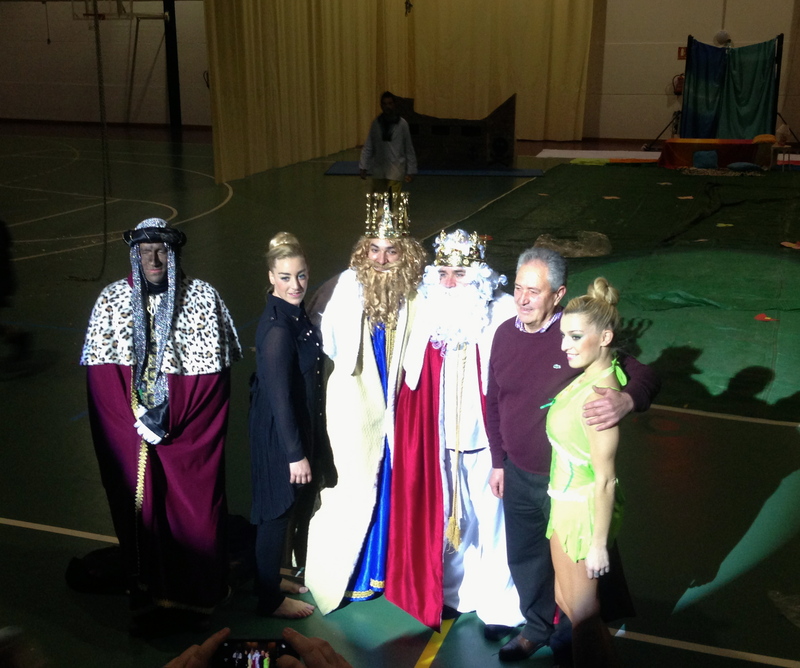 It is a special night analogous to our Christmas Eve as the 3 Reyes Magos will deliver gifts in the night. However, in Spain they leave the gifts in shoes that are left by the window. On January 6, Epiphany the gifts are opened. The cabalgata in Alhama wove through town finishing at the Pabillion, the local sports pavilion. 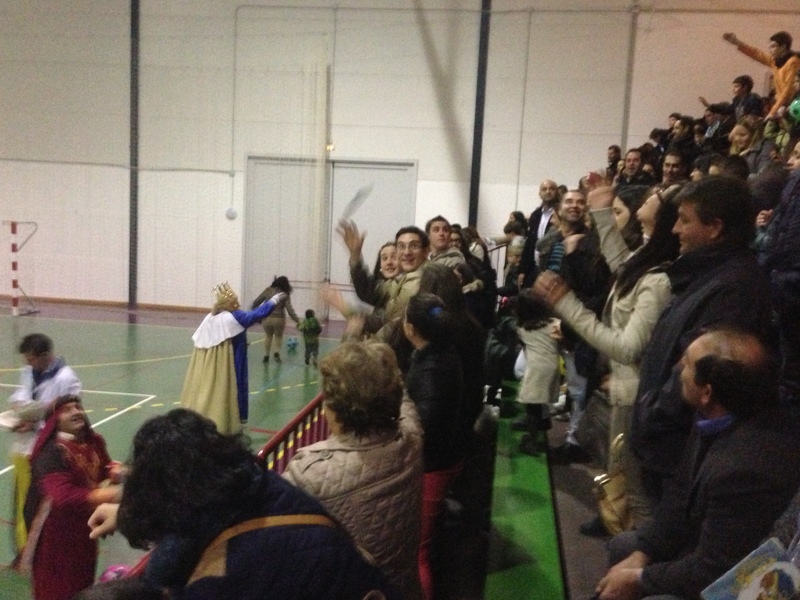 Nearly the entire population of Alhama’s families with children followed the Reyes to the pavilion for the gran finale, the “Espectáculo”. The espectáculo is a show that is put on by none other than Sky and Savannah’s rhythmic gymnastics team. Their coach Patrice selects the theme and choreographs the show. This year they performed Peter Pan. Sky and Savvy were cast as indians. 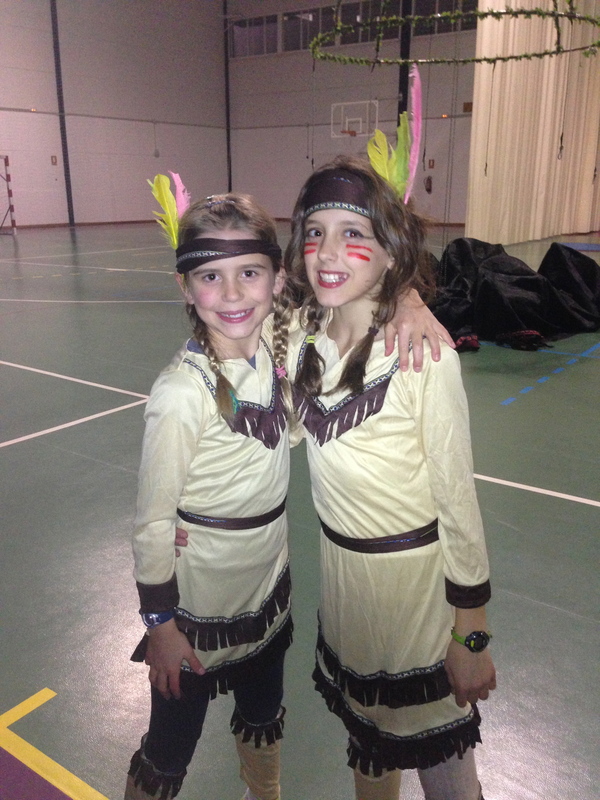 Savannah and Sky as Indians in the Peter Pan show. Sky and Savvy performed with the other little Indians. Here is a short clip. See if you can find them! 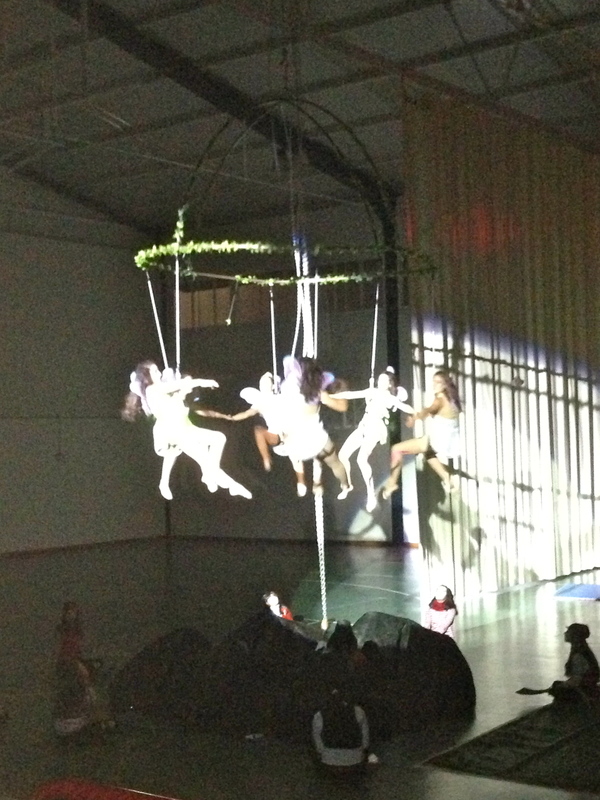 The show was a delight with Patrice and the older gymnasts performing as fairies suspended from a giant ring in the middle of the gym. After the “espectáculo” (I just love calling it that!) the mayor spoke and the 3 Reyes Magos reappeared to throw gifts to/at the crowd. We caught some plastic scissors, a ball and 2 books. We added this to our already huge stash of candy from the parade (which as I write, in March, still sits in a bag in the kitchen cabinet) . Rey, Patrice (gymnastics coach), rey, rey, mayor, tinker bell. While the crowd filed out we climbed down to the floor to congratulate the girls and take some photos. I asked one of the kings to pose with the girls. 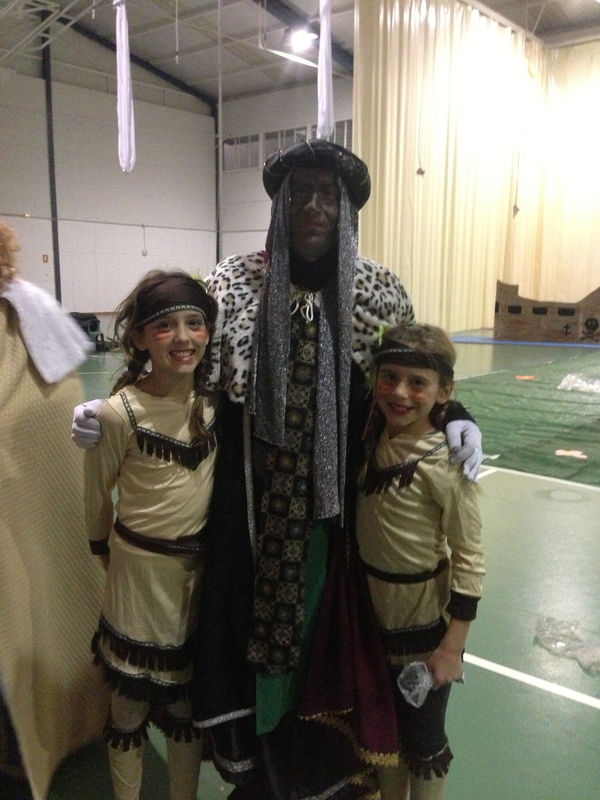 His face was painted and he was in full king-garb so he surprised me when he said “No me conoces? (Don’t you recognize me?)”. I looked closer and recognized his voice and realized that he was the same carpenter who had repaired our window and hung up Mike’s pull-up bar! “Ah, Miguel, eres tú!” He smiled, gave me the normal two beso greeting and gladly posed with the girls. After the show we walked our little indians home to put their shoes under the Christmas tree. In the morning we celebrated and opened the gifts that Los Tres Reyes Magos left for us. January 6 is a Spanish holiday so all of the schools and shops are closed and families spend the day together much like Christmas day back home in the USA. 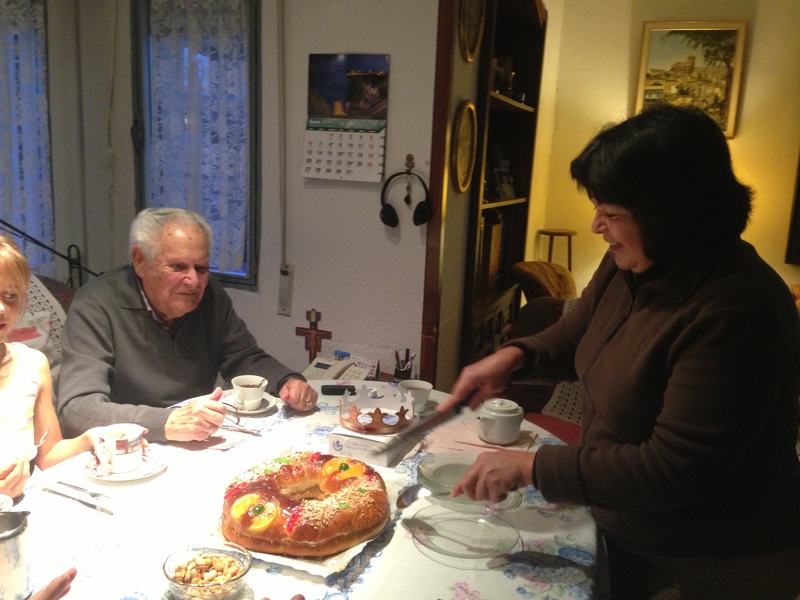 Our adopted grandfather, Juan invited us to spend the afternoon with him to share the tradition of the Roscón de Reyes. Juan lives next door with Elva who is his caretaker and companion. He is the father of Manolo who owns our apartment. Elva is just lovely, she is from Paraguay and has been very dear to us this year. Juan and Elva greeted us like family with big hugs and kisses. The tradition of the roscón was something completely new to us. The roscón is a large 2 layer bunt cake filled with whipped cream. Most people order their roscón from the local bakery. Hidden inside the cream layer are little wrapped treasures. There is always a king and an haba (bean). If you find the king in your piece then you get to wear the paper crown that comes with the cake and be king for the evening. If you find the bean then you will have to pay for the cake the next year. Mike got the bean and jokingly pulled out some money but, of course they wouldn’t accept it. 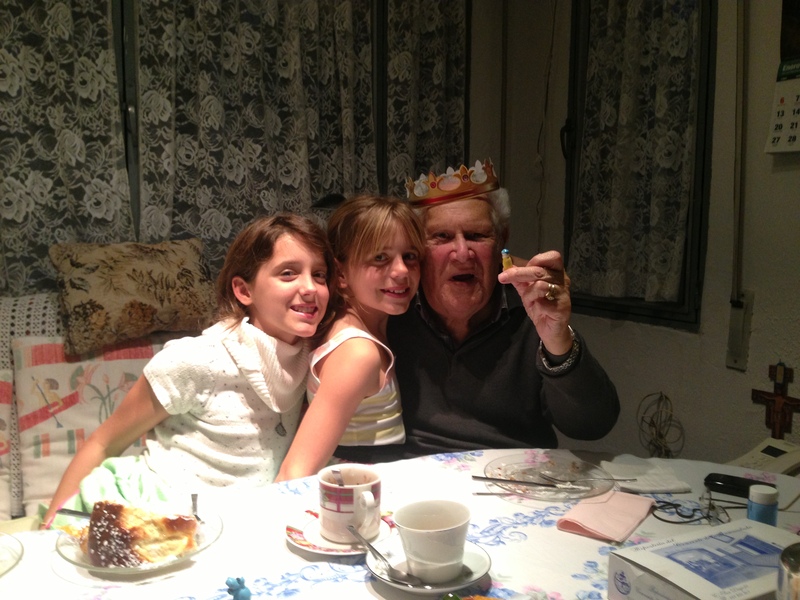 Juan found the king and was delighted to wear the crown for the girls. Juan gets the king and the crown! Sky and Savannah were thrilled to each find a little ceramic hippopotamus in their pieces. I don’t think there is any significance to the hippos. 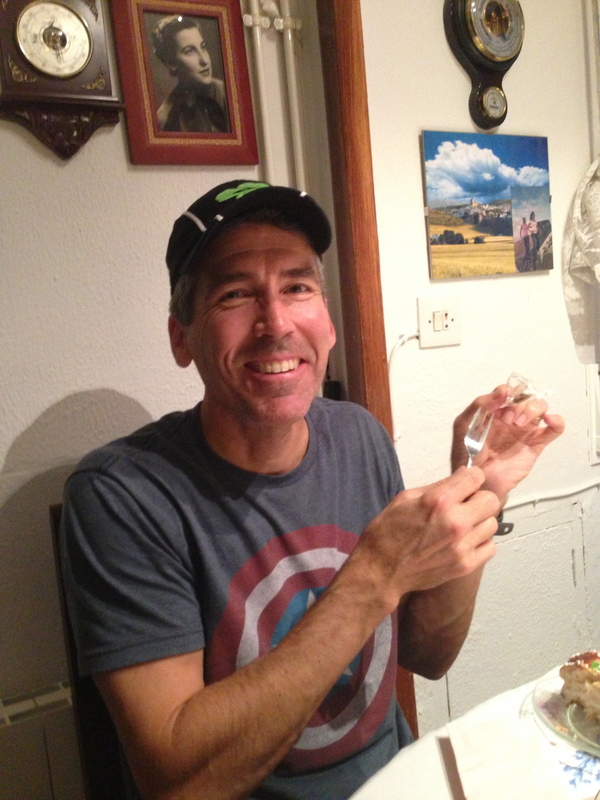 I am not a lover of cake but I found the roscón delicious. The filling was sweet and light while the cake was more of a sweet bread with dried fruits hidden inside. I had 2 servings. 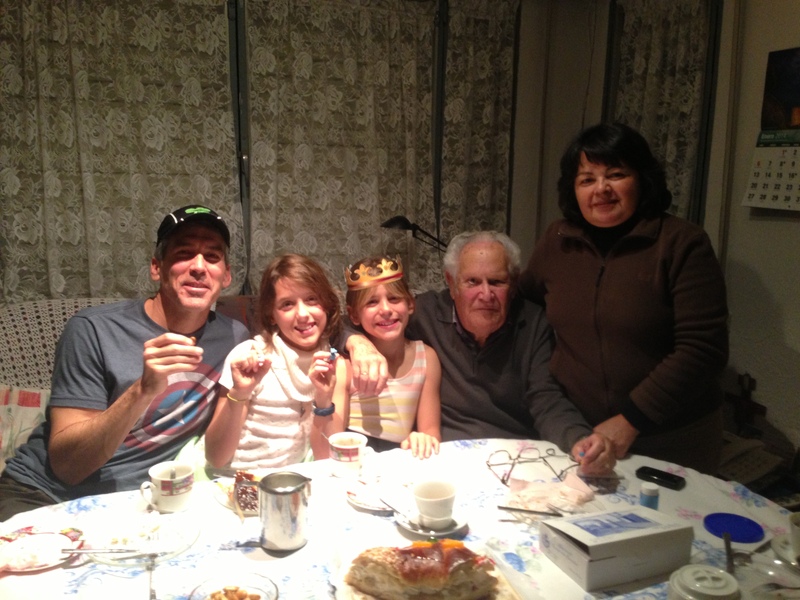 We thanked Juan and Elva for sharing their family tradition with us. 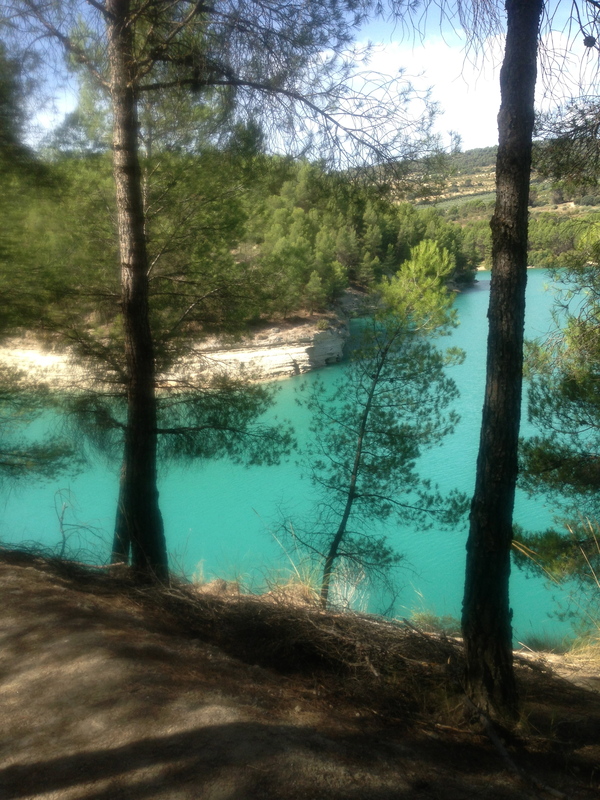 They hugged and kissed us warmly and we went home to bed, our hearts and bellies warm with Spanish hospitality.